Windows 7 incorporates a lot of changes and improvements to the Speech Recognition feature. 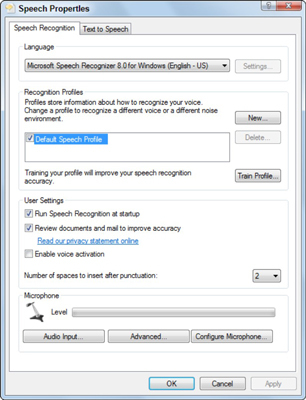 To get the most out of Speech Recognition in Windows 7, you’ll want to change its settings to suit your needs. Once you’ve set up the Speech Recognition feature, you can modify its settings anytime by choosing Start→Control Panel→Ease of Access→Speech Recognition. Language: You can change to a language other than the default English to use when dictating commands and text. You’ll have to have other Windows 7 Language Packs installed. Recognition Profiles: You can create new speech profiles for different users on the same computer. 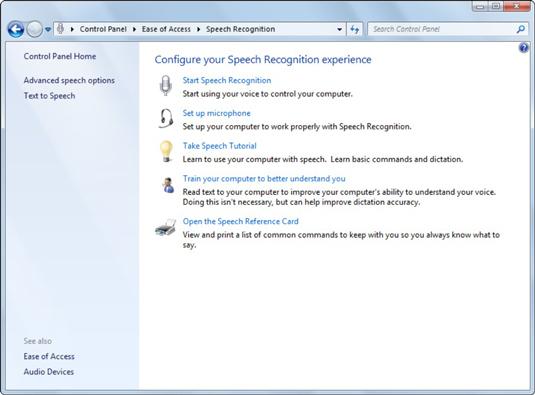 User Settings: You can enable or disable the Run Speech Recognition At Startup and the Allow Computer to Review Your Documents and Mail to Improve Speech Recognition Accuracy features for individual users. Microphone: You can select a new microphone to use (by clicking the Audio Input button) and then get it ready for use with Speech Recognition (by clicking the Configure Microphone button).